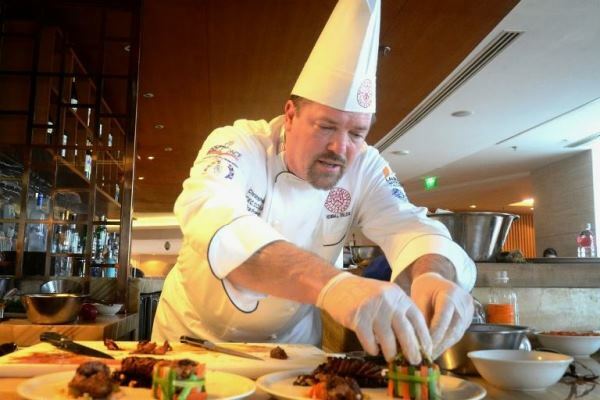 As a chef, it is my business to create memorable dining experiences and food that is unforgettable. Crafting dishes that really wow the guest is a creative endeavor that involves all the senses. Disregarding even one sense will lessen the overall impact and success of the dish. When I create a dish, I consider its appearance. Is it colorful, well-proportioned with various shapes, balanced between negative and positive space, well-designed, and generally attractive? I think about how sound could play into the dish with things like sizzle or crunch? Next I think about the dish’s overall aromatic profile that should be complex and appealing. Then, I move to the mouth where I think about texture and taste. A great dish combines numerous textures in different proportions to keep the dish interesting with every bite. When it comes to taste, I consider how to incorporate all five tastes—sweet, sour, salty, bitter, and umami—in different amounts to create an intriguing balance of flavor. People are sometimes surprised to learn that all five tastes can (and ideally should) fit into as many recipes as possible. The reason for this is that we have different taste receptors for each of our tastes. Thus, striving to stimulate as many tastes as possible creates a big taste impression and a higher level of complexity. But how these tastes are combined and balanced is the art of the dish, and there are an infinite variety of combinations using a multitude of ingredients. Learning to dissect different tastes in a recipe is essential to the creative process. For instance, BBQ sauces incorporate all five tastes in varying amounts to achieve different flavor profiles. Desserts are predominantly sweet and sometimes sour. At the same time, desserts make use of the other tastes — but in a background role. For instance, chocolate, coffee, and caramel add bitter notes. Salt in various doughs or in chocolate preparations is essential. Umami is increasingly found in desserts that incorporate bacon, prosciutto, or green tea. Chefs today are increasingly focusing on umami and making it a more prominent and well thought out part of their creations. The reason is simple. 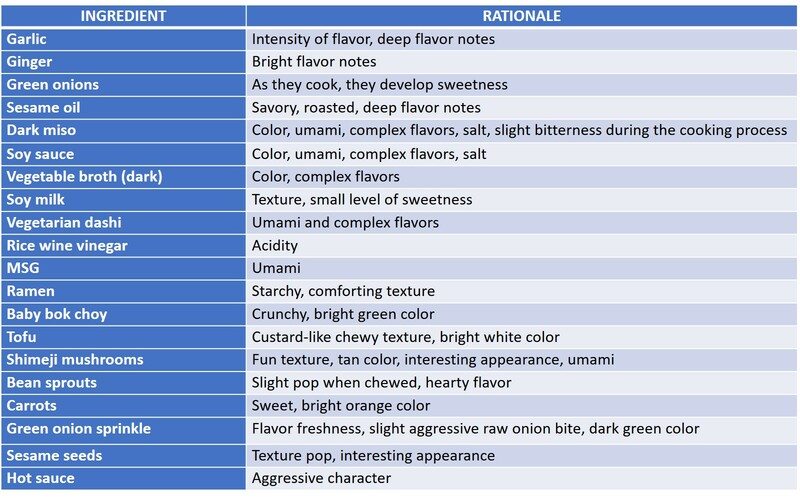 Umami contributes a base note that adds depth of flavor and increases the savory (and delicious) character. There are two basic ways of adding umami. The first is through the use of MSG, which is essentially pure umami. The other way is through the use of umami-rich ingredients like miso, soy sauce, dried shiitake, ketchup, seaweed, fermented fish sauce, cured meats, well-aged cheeses, etc. When to use either technique is a question of the overall impression you want. When I use MSG, it is because I want umami without other flavors. 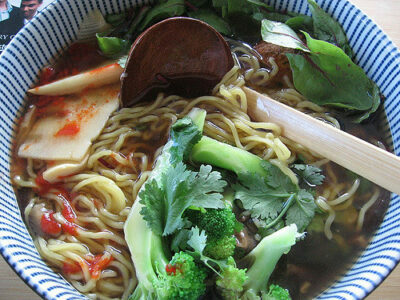 When I use umami-rich ingredients, it is when I want more umami and other flavors. An analysis of the ramen recipe below gives a good idea of how different ingredients contribute different things to the final dish. In a large pot, soak the kombu and shiitake in water for 45 minutes. Slowly bring to a near-boil. Just before it reaches a boil, remove from heat and let sit for at least 30 minutes or until the dashi has a strong umami flavor. Strain and discard solids. In a large pot, warm 3 tbsp. toasted sesame oil over medium heat; sauté garlic, ginger, and white portion of green onion for a minute or two. Add miso and continue sautéing until browning forms on the bottom of the pot. Add vegetable broth and increase heat to a boil. Add soy milk, dashi, rice wine vinegar and MSG; reduce heat to simmer for 15 minutes, whisking from time to time. Meanwhile, in a separate pot, bring 4 qt. water to boil and cook fresh ramen noodles until tender. Strain noodles. In a skillet, add 1 tbsp. toasted sesame oil and mushrooms; sauté for about 3-4 minutes, remove from skillet. Add remaining tbsp. toasted sesame oil and bean sprouts; sauté about 2 minutes until al dente, remove from skillet. Place the hot, cooked ramen noodles into large individual bowls. Top with sautéed mushrooms, bean sprouts, carrots, tofu, optional bok choy, and ramen broth. Sprinkle with green onions, sesame seeds and add optional hot sauce. Header photo courtesy of Eater Chicago.